Adventures in Kindergarten: Don't Hate Me! SO here it is... I feel like the worst blogger in the whole wide world. Really! Every time in the last few weeks that I saw my little icon in my internet toolbar, I get a pang of guilt. I feel like I owe my wonderful, fabulous followers a little bit of an explanation about why on earth I have been so MIA lately. 1. Work! I have been tutoring after school three days a week on top of all the other craziness. 2. Grad school. These two classes that I am taking this semester are KILLING me. I have never had so much work due all at once. 3. We moved into our new house less than three weeks ago. It is darling and I love it, but so much work! So far we have painted every room on the first floor, hung about a billion curtains, installed all new blinds and dealt with having no sink or dishwasher for a week. Whew! 4. After living in our house for 13 days, I threw a huge surprise 30th birthday party for my boyfriend. There were probably 40 people in our house, and I was scrambling for DAYS trying to get everything cleaned up, cooked and bought. I know, I'm a nutcase! It was all worth it for the super surprised look on his face when he walked in. ANYWAY, I promise to get back into the bloggy swing of things VERY soon. It is my super early New Year's resolution. Thanks for hanging in with me, and I promise you lots of new posts and free downloads very soon! 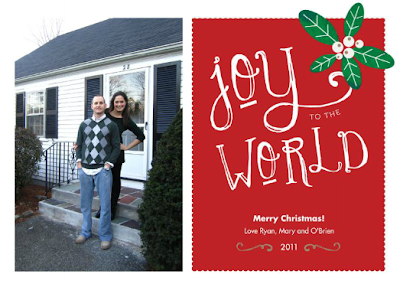 A sneak peek of our Christmas card, taken in front of our new house!